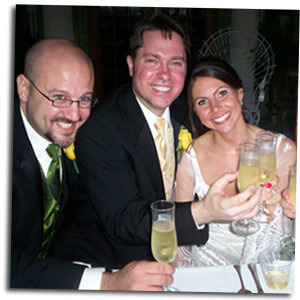 Receptions in Michigan are usually held at a banquet facility or your local hotel. Did you ever think about giving your celebration more of a natural touch with and outdoor setting? Just picture your wedding under a tent next to a beautiful lake. You can even host the reception next to the beach for a warm and inviting vibe. Whatever your preference, read our article below for more tips and options on planning an outdoor ceremony. # 1. For colder months, how are we going to heat up the space at the location? # 2. If it starts to rain or gets too hot, is there a tent setup to cover my guests? # 3. How close is the inside alternative? How long does it take to relocate the day of? # 4. What kind of time frame are we looking at for deciding if it will be inside or outside? How gets to make that decision? Some places are very strict and you want to know what to expect. Any reputable reception venue will be able to accommodate a reserved site for a worse case scenario. They do this to reduce the headache if the situation arises. For example, Garden Park in Holly is known for their beautiful outdoor space. At the same time you can have the ceremony or reception held in a tent right next to the garden. It’s unfortunate, because not every venue to provide this type of reassurance. A majority of places are required to have a backup plan because their local competition has it available. You need to find out if this is included with the package or costs extra. If it is not available, then you might have to book a space at a secondary location dependent upon the weather. Not every clients has to deal with the concerns of planning an outdoor wedding ceremony. The most noticeable concern is the additional expense of reserving another space/tent. Regardless, if you are planning your big day outside you will definitely need to have something else reserved. This helps to reduce the miscommunication that can happen if you have to make last minute changes the day of. To sum it up, the perfect outside wedding the thought through months beforehand. If you neglect to reserve the location it will lead to chaos as you and your guests scramble last minute to think of what to do. Try to give your guests the chance to know there is an indoor option in case the call has to be made. Your main goal with planning an outdoor Michigan wedding is to be prepared for the worse by quickly moving guests to the backup site. Wow, I have a blog too but I can’t write as well as you do. Good stuff!